A native of Tuscaloosa, Alabama, Suzanne has lived in Charlotte, NC since 1986. She has been a psychotherapist in private practice for over 25 years. In 2009 she went through cancer, and in 2012, she went through the high Himalaya. Cancer changed her life, Nepal changed her! 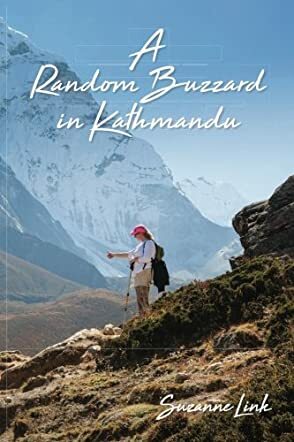 A Random Buzzard In Kathmandu by Suzanne Link is a memoir written by Suzanne about her journey battling with cancer and her subsequent travel to the Himalayas. The narrative begins with her initial diagnosis of breast cancer and the chemotherapy and radiation she went through with its side effects such as nausea, hair loss, etc. Her health improves and around the same time she hears of a trip to the Himalayas comprised of cancer survivors, and it sounds like a great way to rejuvenate and get a new perspective. What follows is Suzanne’s journey through Nepal on a trekking expedition that includes summiting mountains and experiencing the majesty and sublimity of the Himalayas, descriptions of the group that she travels with, and the friendships she forms both with her teammates as well as Sherpas, the acclimatization and health challenges, and the lessons she learns from all of this. I enjoyed reading A Random Buzzard In Kathmandu and, having been to the Himalayas myself, although not in the same areas as Suzanne, I could certainly relate to the travel experience of high altitude, etc. This story is two-fold and runs in parallel: Suzanne’s fight with cancer and her travel experience with her group in the Himalayas. It is exciting to get right into the middle of the Himalayan range, so to speak, and to glimpse mighty peaks such as Everest. The local travel in Kathmandu and villages along the route is also interesting. I very much enjoyed reading this memoir.